23 August 2017. A year ago. Swifts Hill, Slad, where Diddley’s ashes lie. We were recommended to Alice’s Bear Shop and Hospital for Poorly Bears and Dolls. They are so busy, an appointment was made for 20 August. Weeks later. Alice’s Bear Shop and Hospital for poorly bears and dolls. And here we are in beautiful Lyme Regis. Home of Alice’s Bear Shop. A long way from home. Bobby decided to make it a holiday. Doctor Dave recommended staying in Ilminster Travelodge. As we drove just 14 miles from Somerset, through Devon to Dorset, I could see Bobby thinking of times gone by. But we try to live in the moment now and here is Doctor Dave and Nurse Lesley taking over for a few days. Very good hands indeed. A day to remember, three years since our lives changed for ever. A day to celebrate our good fortune in having friends to share it with and have fun. But not forget how we got here. And, ultimately, driving from Somerset to Devon to Dorset and not being pinched for speeding on a road where the speeding signs out numbered the trees. And you will read all about it in a story about the “Speed Awareness Course”. OOoooooh errrr. Soon. Ha ha ha. Idiot. Back to Alice’s Bear Shop. Ladies making teddy bears. No sign of the Doc or Nurse Lesley. Instead, here was Nurse Rikey. What a laugh.A teddy bear nutter. She has even written books and gave us one. Bobby wouldn’t shut up and I could see where this was heading. Straight through a sea of teddy bears to the “bears who need a home”. Rescue bears. Old bears. What he didn’t realise was that I had already made friends with one and done a deal! We need a home. Rescue bears. Eamonn: “Hello. Moy name is Eamonn. Oy come from te Emerald Oyle. Oy am very old. Maybe 1940. Tatty. knackered and worst of all, unloved. Oy was left at Alice’s Teddy Bear Hospital. They gave me new pads for my paws and feet and placed me with all the bears looking for a home. Someone to love them. And so, now we have a new member of Mindfully Bertie. On the way back home, we stopped at Diddley’s bench and told him all about Diddley. 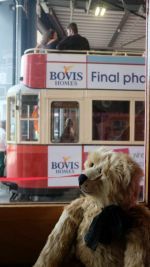 SEB’s Story (on the Seaton Tramway). And here we were, sitting on a miniature tram. Upstairs. Me just out of hospital. And I forgot to mention how well the hospital had scrubbed me up. Soft as a baby’s bottom. I could give myself a big hug. A little boy and a lady came upstairs. He asked her and Bobby if he could sit with me. We smiled and said, “of course”. Bobby asked if he could take pictures. Granny Ya Ya smiled. Seb smiled. We all smiled. “Seb is short for Sebastian” he told us. “I am five. And I love you, Bertie” and hugged me all the way to the terminus. Bobby told him all about the trams. Why I had been in hospital. Asked him to hold me for pictures of other trams. And Bobby remembered when he had five year old children and grandchildren who clung to every word. And that’s why love affairs, true friendships and partnerships cannot be bought. I would not have been on the tram without Bobby. But I was the difference between an old man’s daydream and making a little boy called Seb happy. Granny Ya Ya up there somewhere. On 23 August 2018 at Ilminster Travelodge. Three years gone by. You would have loved that little boy. Eomean is a very gentlemanly-looking bear, in that ruggedly Irish way the Irish look. Welcome back Bertie. Thank goodness, or we’d have had to put up with Bobby’s solo ramblings..